State Rep. Susan Manchester presented John Vehre with a proclamation celebrating his career and accomplishments. GREENVILLE – The Greenville Public Library staff and board held an open house for retiring Director John Vehre on Jan. 18 with many well-wishers stopping by to chat and enjoy refreshments. 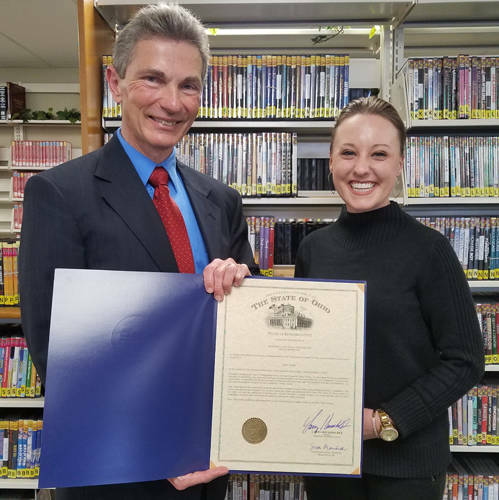 State Rep. Susan Manchester presented Vehre with a proclamation celebrating his career and accomplishments. A dinner was then held at the Bistro where both current and former staff and board members congratulated Vehre and regaled him with funny stories and heartfelt praise. The highlight of the evening was “burning the mortgage” when Vehre lit a copy of the loan paperwork to symbolize paying off the building expansion loan in record time.